Financial Planning For and During a Divorce - Amaral & Associates, P.C. Based upon the budget you create, you can figure out whether you need to make any cuts in the budget, where you can. Also, if based upon your budget, you can determine what assets may be best for you to walk away with in the divorce, once marital assets are divided. 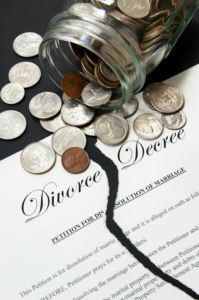 As part of your budget, you will want to consider what your income will be after the divorce. If you are working, you will know what your income will be from work. However, you will also want to consider if you will be receiving or paying child support and/or alimony. In Massachusetts, a child support order can run until children are 23 years old, provided they attend college. Spouses must take this into consideration when factoring their income. Massachusetts has Child Support Guidelines for spouses to calculate the child support order based on their respective incomes. Generally, the first $250,000 of the parties combined gross income is used to calculate child support. As for alimony, if the parties have children, and have a combined gross income of over $250,000, then there is a chance that the lesser earning spouse could receive alimony. There are exceptions to this $250,000 gross income, where a spouse may receive alimony and the parties do not have a combined gross income of $250,000, but these are highly fact-specific circumstances. If there are no children of the marriage, then there is no minimum income used to calculate alimony. However, that doesn’t guarantee that alimony will be awarded. There are many factors considered in awarding alimony, as outlined in M.G.L. c. 208 §53. Each spouse should consult their respective attorney to determine whether there will be an alimony order in their case. If alimony is awarded in a case, it will be based upon a formula developed when the Massachusetts Alimony Reform Act of 2011 went into effect. There 4 types of alimony in Massachusetts: 1) General Term Alimony; 2) Rehabilitative Alimony; 3) Reimbursement Alimony; and 4) Transitional Alimony. Depending on the specific facts of your circumstances, any one of these types of alimony could be awarded in your divorce. The amount and duration of the alimony will depend on the type of alimony awarded. As part of a divorce, all marital assets are divided. This includes all bank accounts, investment accounts, retirement accounts, stocks, future inheritance, real estate, business interests, vehicles, personal property, and any other property owned by the spouses. When negotiating the division of assets, consider your income and your budget. Is it more beneficial to you to receive liquid assets, such as investment accounts, or is it better for you to receive real estate? The answer to this question is always fact-specific, but you should consider your circumstances, and what would meet your needs most once the divorce is finalized. Retaining real estate can give some continuity, particularly if you are retaining the marital home for the children to continue living in. However, real estate doesn’t make cash available to you immediately. The real estate can appreciate or depreciate, and you will not get your equity out of the real estate until it is sold. Whereas, liquid accounts will give you access to money fairly quickly. Each person should also consider the tax consequences of retaining each asset, as there usually are tax benefits or tax penalties for retaining or transferring certain assets. There is no “one size fits all” answer to this question. Each person should review their financial circumstances to determine what works best for himself/herself. Towards the beginning of your divorce, you will want to begin your financial independence from your spouse. Massachusetts has a prohibition on depleting, transferring, or encumbering marital assets, pursuant to Supplemental Probate and Family Court Rule 411, so you cannot unilaterally deplete, cash out, or transfer any assets. However, you can begin your financial independence by opening your own individual bank account. Once the account is opened, you can begin depositing your income into this account, and using this account for your regular living expenses. You may also want to open a credit card account without your spouse as a joint user. That way you begin to build credit in your name alone. By taking these steps, you begin to segregate your finances from your spouse, and begin to understand how to manage your money without your spouse’s involvement. Depending on the total value of the marital estate, and each spouse’s gross incomes, it may be wise to retain a Financial Advisor, to assist you through the divorce process and give you guidance as to a budget, the tax consequences of divorce, and also what assets you should retain. There are financial advisors who specialize in divorce, known as Certified Divorce Financial Analysts, who can guide you through this process.